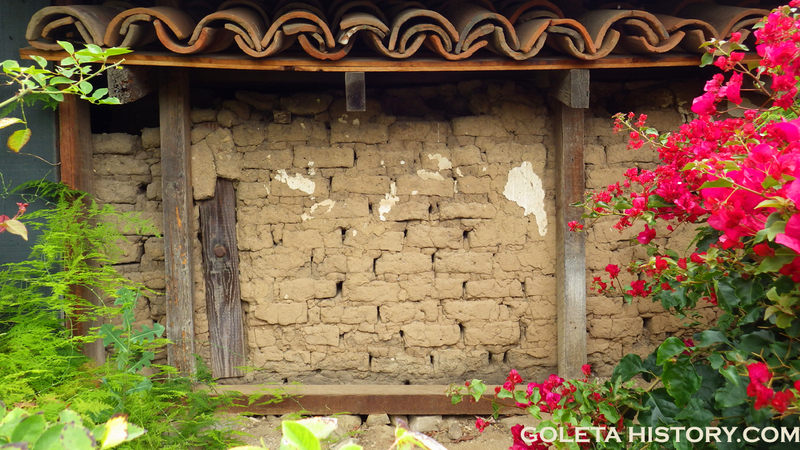 What is the oldest building in the Goleta Valley? Most folks have never heard of it, or have any idea of its existence. But this little building played a major role in the history of Goleta, the success of the Santa Barbara Mission and the wine industry of California. Nestled on a private ranch in the foothills of Goleta, it’s called the San Jose winery. 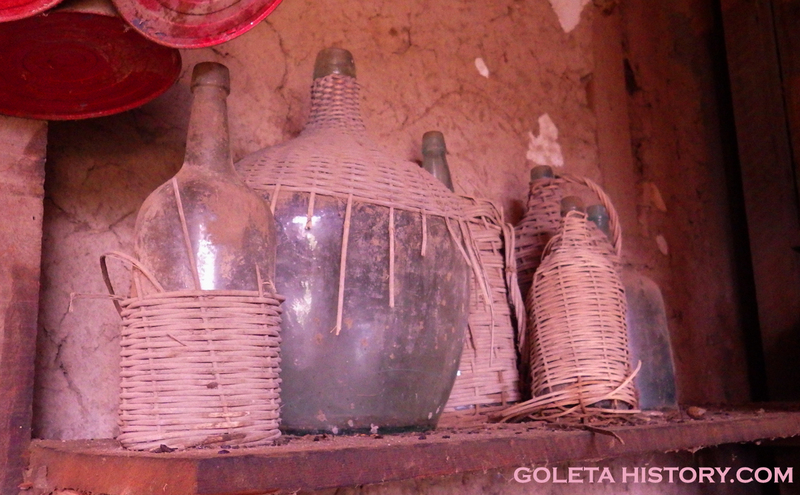 California’s modern wine industry began at the missions. 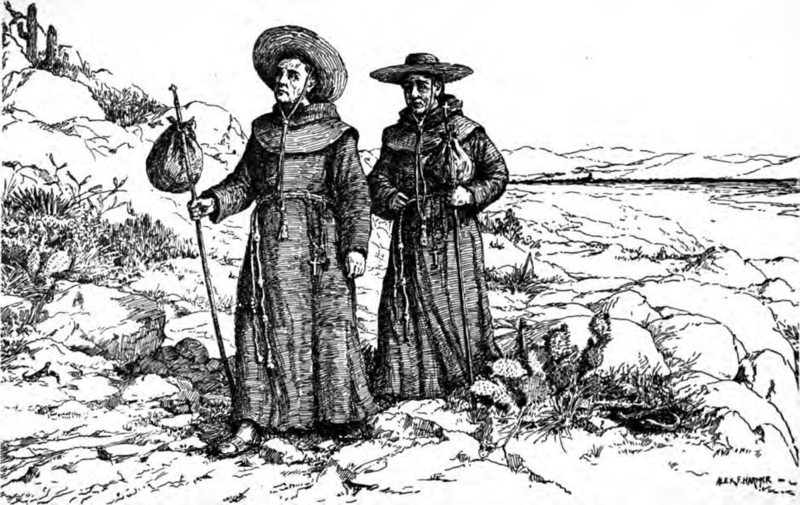 The Spanish Franciscans established twenty-one California missions starting in San Diego in 1769 and to the mission padres, wine was an essential item. Therefore, planting a vineyard for each mission was a high priority. Wine was used for communion in their services, as a drink with meals, as medicine, and once established, it became one of their main sources of income. There were grapes growing in California before the Spanish padres came, but they were only used for eating. The padres brought their own vines with them and the local “neophytes” were used to plant and harvest the grapes. When a new mission was founded, the other missions were expected to help it out by sending grapevine cuttings for planting. 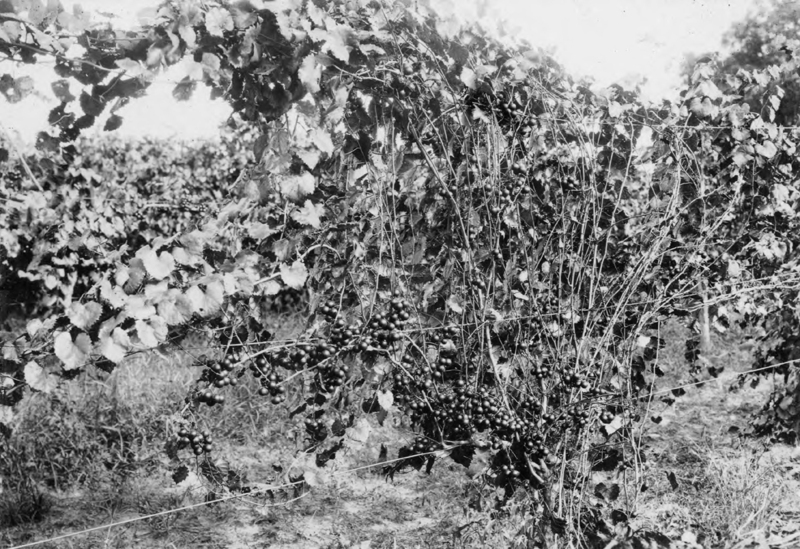 Mission grapes, a variety known as Listan Prieto, were high in sugar content, low in acid, and produced a sweet wine. The Santa Barbara mission had three vineyards: Mission Canyon, La Cieneguita and San Jose, an 8 acre lot named for the San Jose creek that ran along its eastern border. Planting, maintaining, harvesting the grapes, and producing the wine was all done by Chumash laborers. Most missions used fences made of cactus to keep animals from straying into the grapes and at some locations platforms were built in the vineyards where young workers stood beating drums to scare away the birds. 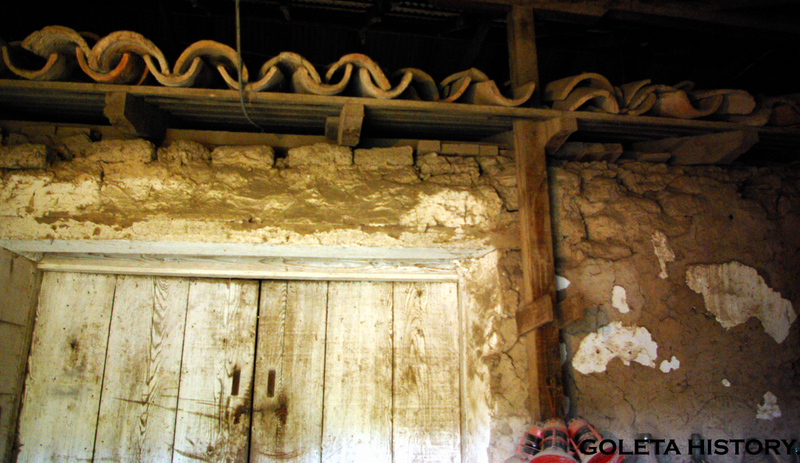 While the exact date of the construction of the adobe at the San Jose winery is uncertain, it is known that it was built by Chumash laborers somewhere between 1804-1834. 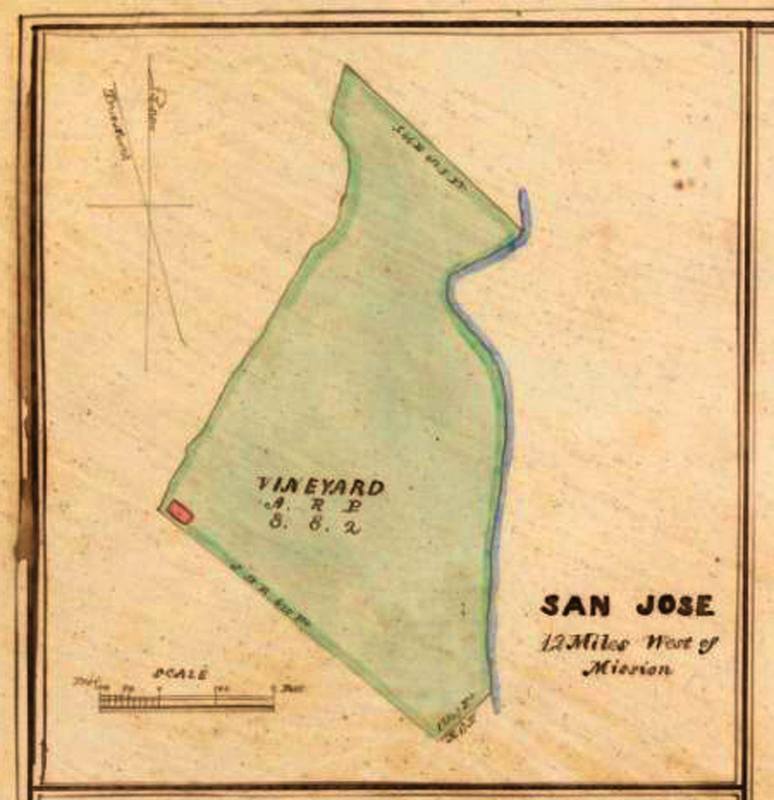 There are records of corn, beans and wheat being planted at San Jose in 1804, but no mention of when the first grape vines were planted. Given the need for wine, one could assume that grape vines would have been planted ASAP. We do know that by 1845, the vineyard had over 2,200 vines and 100 fruit trees. 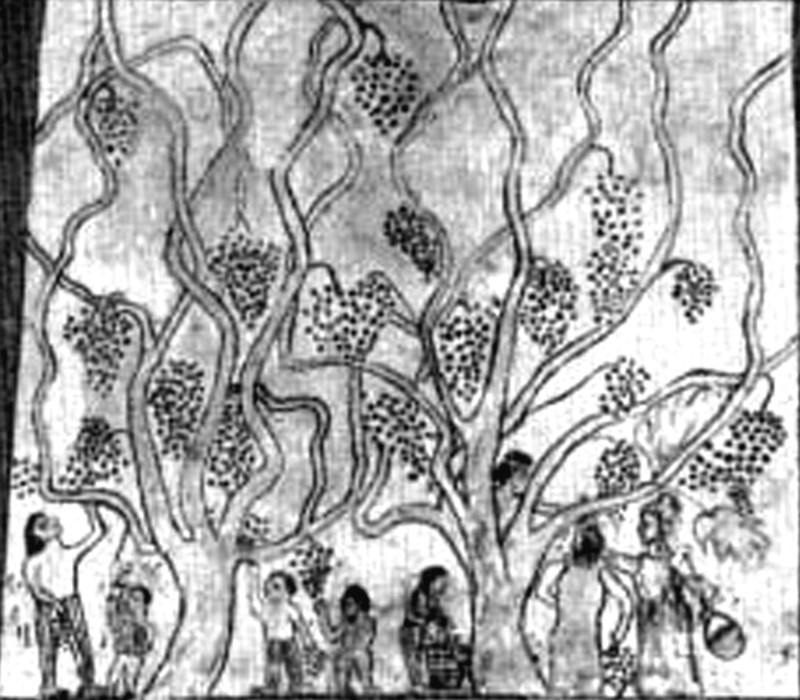 The grapes were used not only to make wine, but also raisins. In 1856, the church leased the vineyard and winery to an Irish immigrant named James McCaffrey and it was immediately profitable for him. Shortly thereafter, the IRS seized the winery and shut it down due to a lack of the proper paperwork being filled out. They wanted $1,000 from McCaffrey but he refused to pay. While lawyers eventually worked it out, the IRS appointed keepers to stay at the property. One of these was a “great drunken lout”, who would drink brandy until he passed out and McCaffrey’s son would put him to bed. The Great Drought of 1863-64 nearly exterminated all the cattle in Goleta and left many of its big ranches in bankruptcy. Thanks to the San Jose vineyard and winery, McCaffrey not only survived, but he thrived. In 1871 he bought the property from the mission, expanded it to over 6,000 vines and continued his successful wine making operation until the mid 1890’s. He became well known for his fine wines. 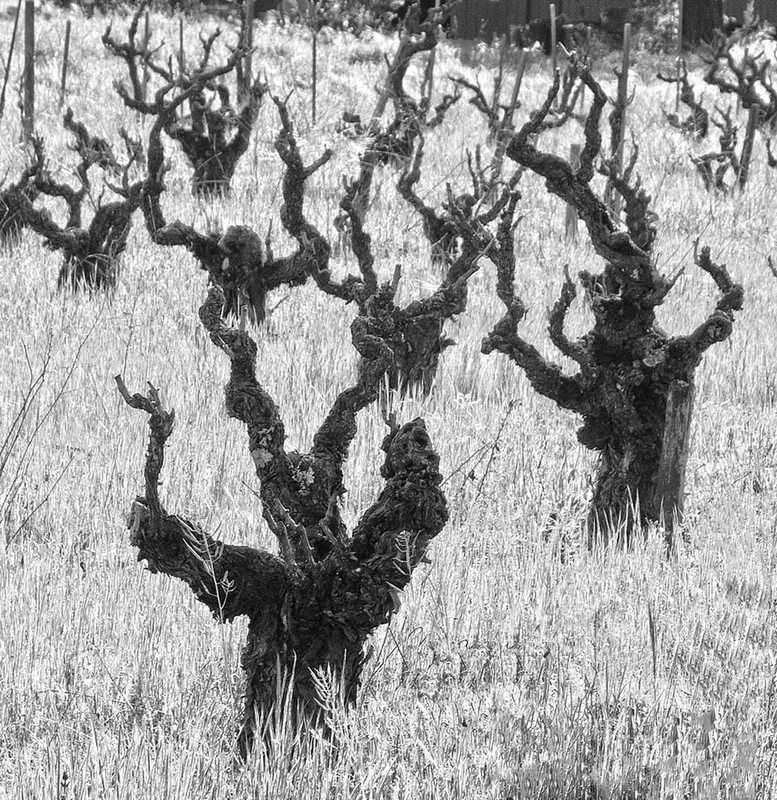 A San Francisco newspaper from 1882 reported that the vineyard had not been plowed or cultivated for 30 years, and that “McCaffrey declines to explain how he never fails to have a full crop while his neighbors have none”. Also, it describes the adobe as having a vine that starts near the door then divides and sends a branch in opposite directions. The branches grow completely around the building and reconnect back at the front, “forming a complete hoop around the building”. In 1895, McCaffrey was getting too old to keep it up, so he leased the winery to one of his employees, an Italian immigrant named Michele Cavaletto. James McCaffrey passed away in 1900 and the property was sold to Cavaletto. The winery flourished under Cavaletto, who sold grapes and wine to buyers throughout the United States. 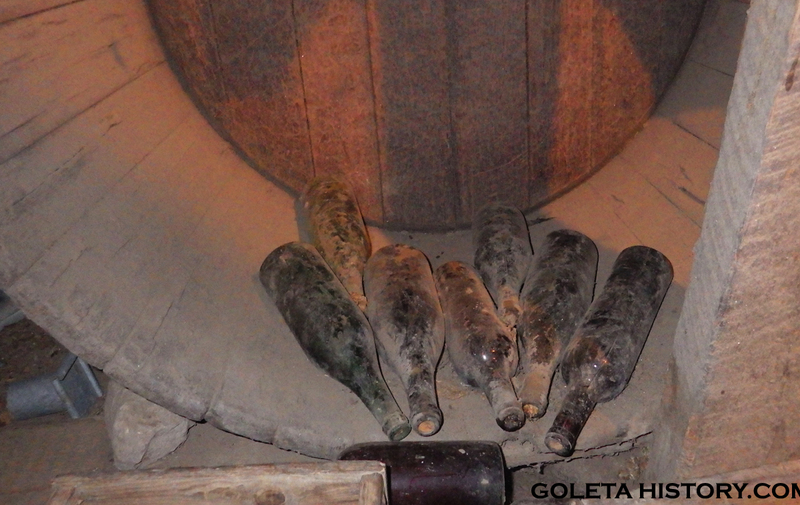 The Cavaletto family continued the wine operation until Prohibition began in 1919. 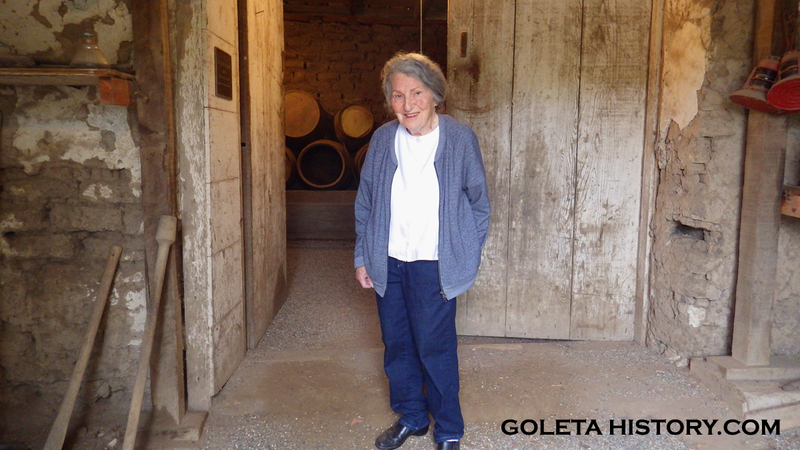 Michele recognized the historic importance of the winery building and constructed a metal roof and wood siding to protect the old adobe from the elements. Michele passed away in 1921 and his son Joseph, who was born on the property in 1902, farmed it his entire life until he passed in 1973. The San Jose vineyard property is still operated today by the Cavaletto family, but the grape vines have been replaced by avocado trees. 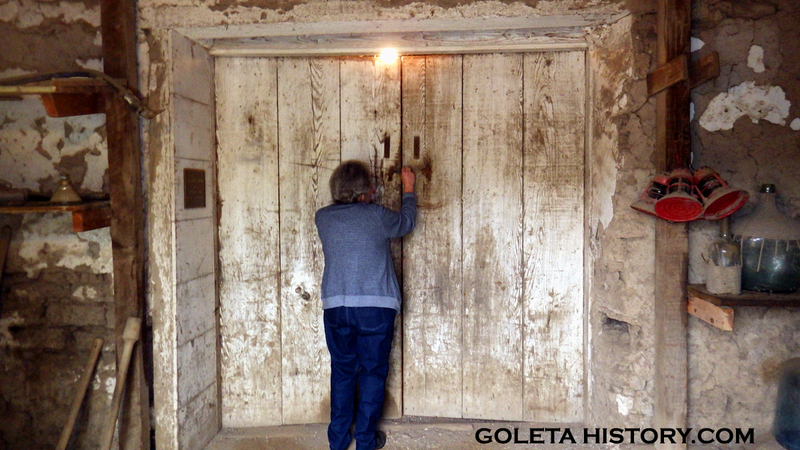 We were lucky enough to be invited to view the historic adobe by Catherine Cavaletto, Joseph’s daughter. 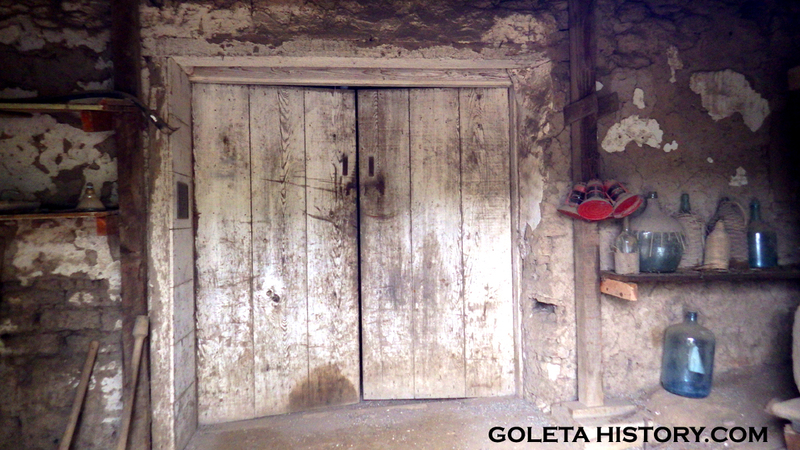 Needless to say, we were excited to see what treasures lie behind these old wooden doors. A debt of gratitude is owed to the entire Cavaletto clan for taking action and preserving this precious landmark back in the 1920’s. If not for their foresight, it would probably be just another lost memory by now. 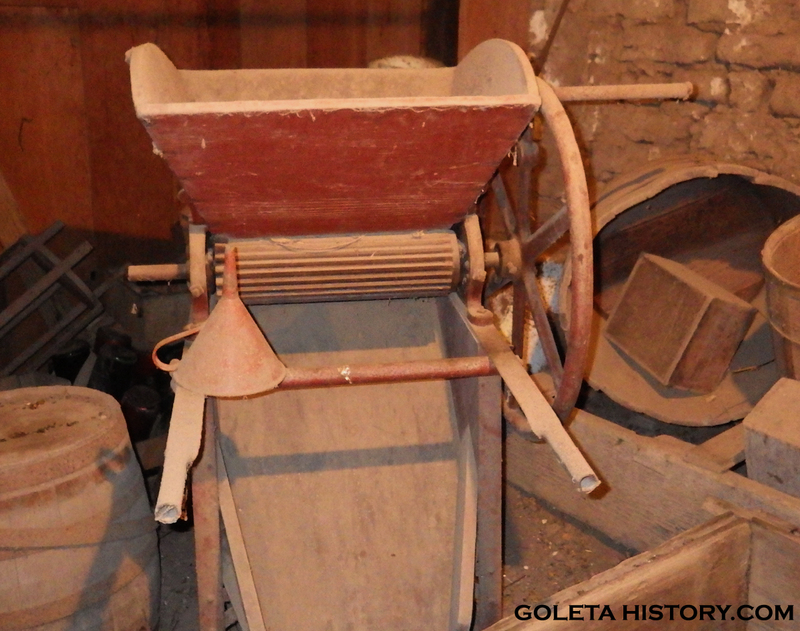 The interior of the adobe is a treasure trove of historic tools of the winemaking trade. A grape crusher and de-stemmer, a fermentation vat, wine barrels and a wine press, as well as a multitude of wine bottles of varying ages. 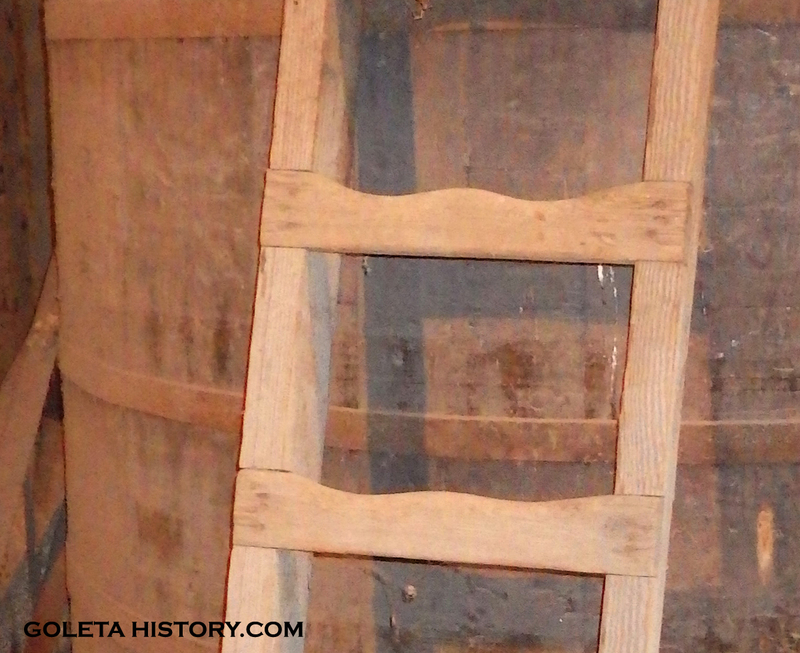 The wooden ladder on the fermentation vat shows the wear and tear of over 100 years of use. 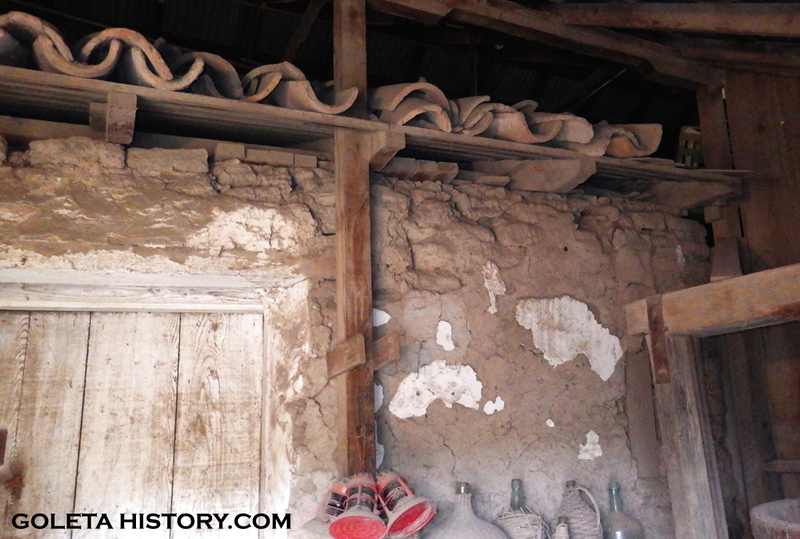 It was fascinating to look at the roof tiles and adobe bricks made by the hands of Chumash craftsman nearly 200 years ago. 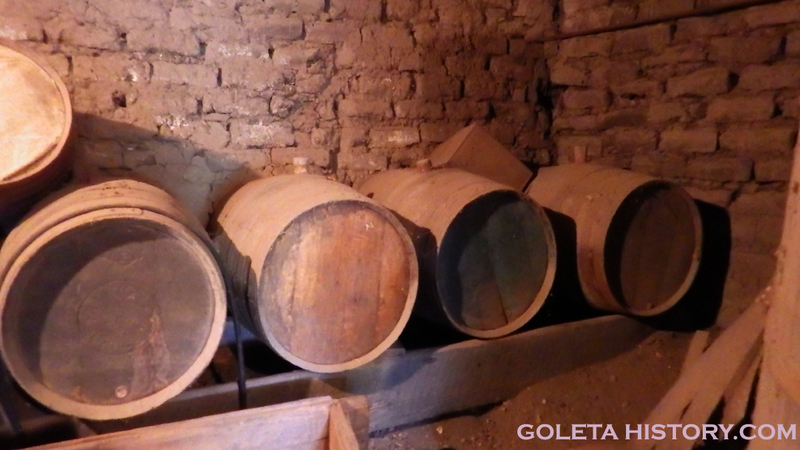 A fine collection of wooden barrels are stacked neatly, probably from different eras of wine production. Some carry the mark of G.H. Moore Bourbon, vintage around 1870. 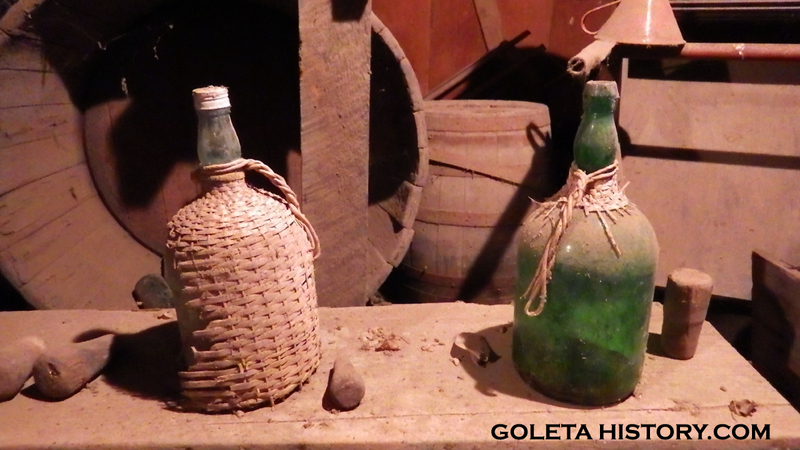 Originally, the mission padres used cow hide bags to ferment and transport their wine. 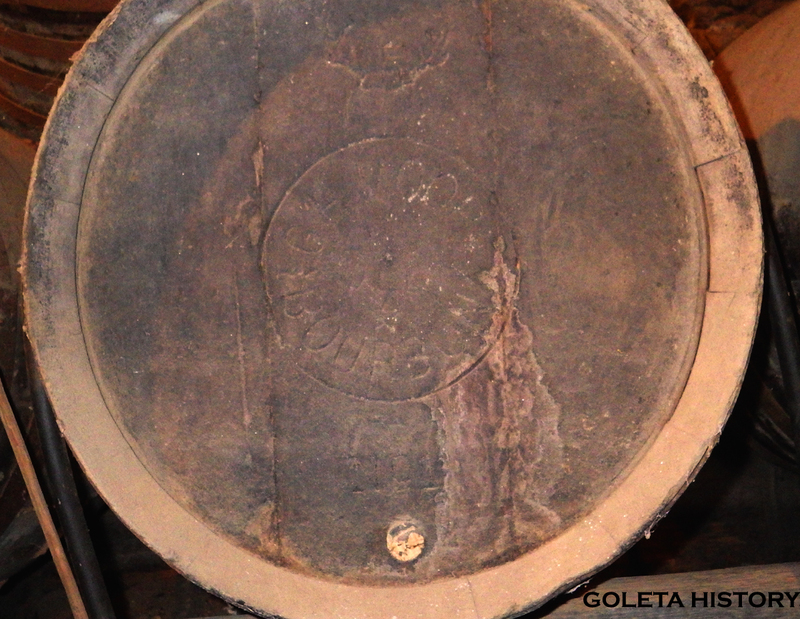 Eventually, wooden casks became available, often being re-purposed from other distilleries. There are a variety of different sized, shaped and colored wine bottles strewn about. Many of them with straw baskets around them. These are called fiaschi, which means straw-covered glass flasks, (singular is fiasco). The straw wrapping was devised as a way to safely transport thin and weak glass bottles in the 19th century, and continued throughout the years as a tradition. Some more recent bottles are still corked. After prohibition, small batches of wine were still made by the Cavalettos for family consumption and special occasions up until the 1950’s. 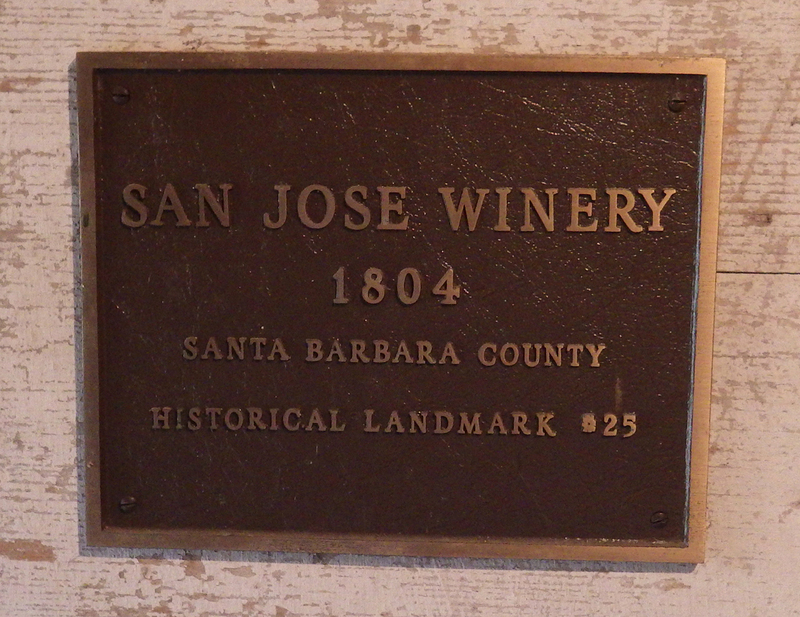 In 1984, Santa Barbara County recognized the San Jose winery as a landmark. They posted this plaque on the front wall, but the 1804 construction date has since been reconsidered. Whatever the exact construction date, it’s amazing that this historic building has survived through the centuries. Today ownership of the property is with Mike Cavaletto, grandson of Michele and son of Joseph. It is not open to the public. 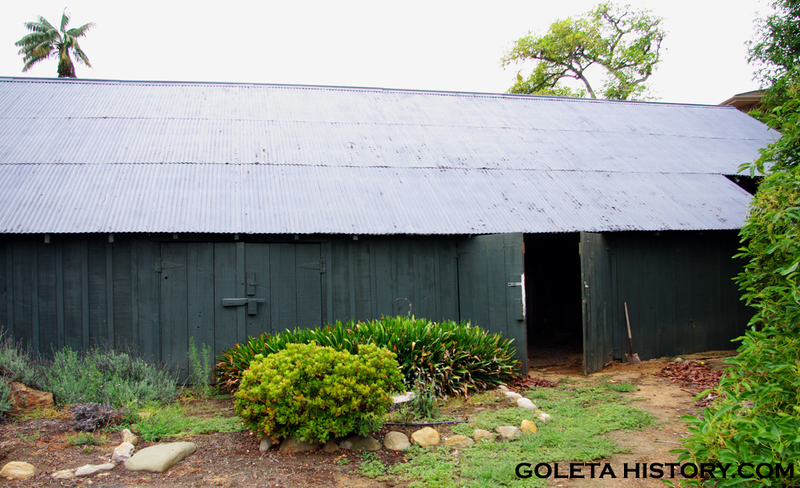 It’s worth restating that this little building is not only significant in the history of Goleta, it played an important role in the mission’s conquest of California for Spain and a it’s landmark of the birth of the now thriving wine industry in California. Lift your wine glass to the survival of the San Jose winery! The San Jose Winery is on a private working ranch and is not open to the public. Sources: Catherine Cavaletto, Michael Redmon, Justin Ruhge, San Francisco Alta newspaper, Walker A. Tompkins, Santa Barbara County, Santa Barbara Independent, Thomas Pinney, Wikipedia, UC Press, Rev. J.J. O’Keefe, University of California Books, Thompson and West, Steampunk Wines, Russell Johnson, Society for Culinary Arts and letters, and special thanks to Rob Ramirez. tom – enjoyed reading your fascinating account of the san jose winery. 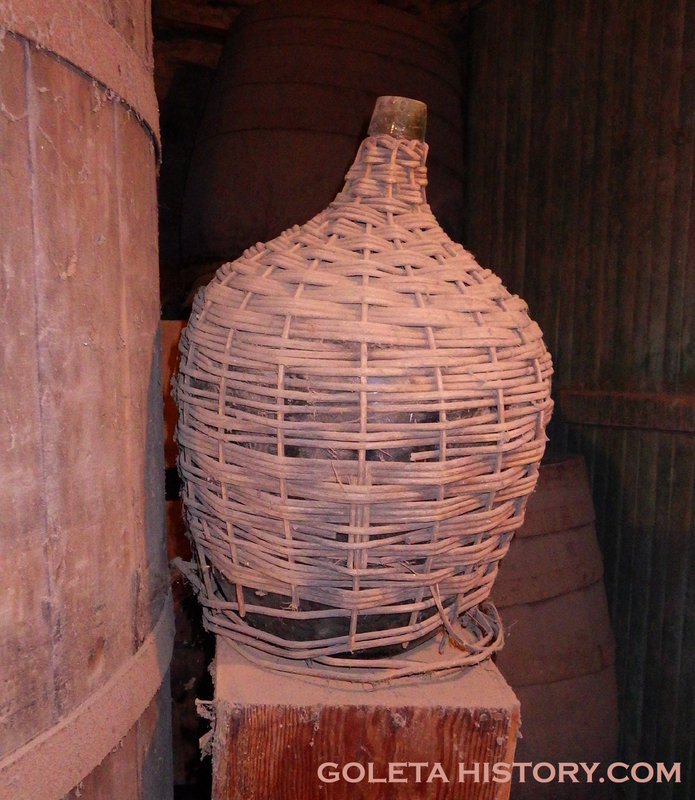 the photos are very interesting – especially of the adobe work and the wine making tools. 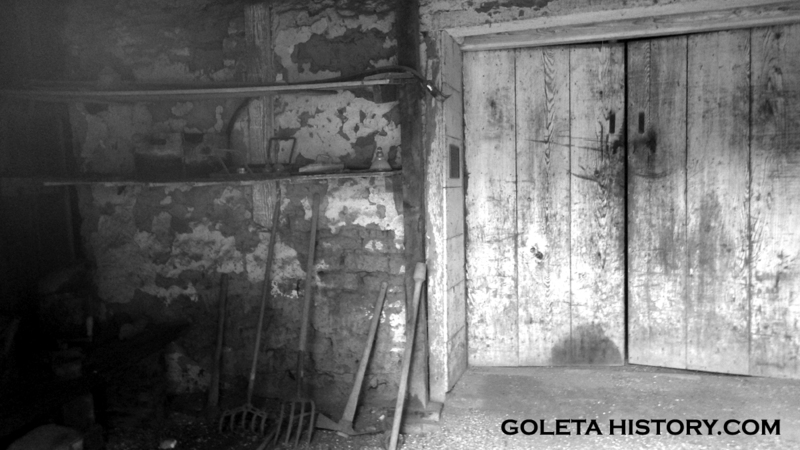 your passion, research and stories of local goleta history are a great gift to us. thank you for all you do to make our little valley shine. p.s. and thank you for your part in getting the gas station preserved – awesome!